Three quarters of GPs have prescribed anti-depressants even though they think another treatment would have been more effective, a survey has found. The Mental Health Foundation says meditation halves the risk of repeated depression and should be more readily available, but access is very limited. The Department of Health in England said access had improved. Depression affects one in 10 people a year, with more than half of those experiencing more than one episode. The Mental Health Foundation says mindfulness-based cognitive therapy (MBCT) halves the risk of further bouts of depression. A course of MBCT treatment, which typically lasts for eight weeks, combines meditation with cognitive behaviour therapy and yoga. The Department of Health in England said GPs could now refer patients on to specialists for full assessment of their needs. It is estimated to cost the UK economy £7.5bn a year and prescriptions for antidepressants have soared in recent years, reaching 36 million in 2008. But the report finds 75% of GPs have prescribed medication to people with long-term depression believing that another treatment - often less readily available - would be more appropriate. 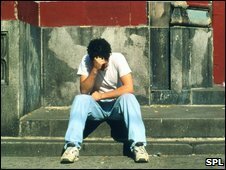 The National Institute for health and Clinical Excellence (NICE) has recommended MBCT for recurrent depression since 2004. But the latest report found that just one in five GPs say they can access the treatment for their patients, and only one in 20 prescribe it regularly. The report says the training and development needed to increase access to MBCT could be achieved under funding already made available by the government to improve access to psychological therapies. Dr Andrew McCulloch, chief executive of the Mental Health Foundation, said: "Mindfulness-based therapy could be helping to prevent thousands of people from relapsing into depression, every year. "This would have huge knock-on benefits both socially and economically, making it a sensible treatment to be making available, even at a time when money is short within the NHS." People are taught that many of their usual reactions are automatic, destructive and lead to a state of "brooding recrimination"
Professor Mark Williams, director of the Mindfulness Centre at the University of Oxford, said meditation had been shown to have powerful effects on health. MBCT has been linked to increased activity in the pre-frontal cortex, an area of the brain associated with positive emotion. Studies have also shown that areas of the brain linked to emotional regulation are larger in people who have meditated regularly for five years. Professor Williams said: "We now have a very good treatment for recurrent depression, which urgently needs to be rolled out to all patients that need it." The report also says MBCT can help treat a range of other conditions, such as eating disorders, anxiety problems and physical problems associated with cancer and HIV. A Department of Health spokesperson said the Improving Access to Psychological Therapies (IAPT) scheme had expanded the range of talking therapies on offer to patients. GPs could refer a patient to local IAPT services, and then following assessment, the patient would be offered the most suitable therapy, of which MBCT was one option. "In 2010, not only will more and more services go live, but they will move to offer a wider range of therapies."